GOOD CONDITION - This item was removed from a running and driving vehicle and it has been tested and is fully working as it should. If you have any questions please send us an email. Please see our other items for more car parts. Many thanks for looking. Jeep Cherokee XJ ZJ 4.0 Siemens Injectors OEM . Condition is Used. Taken from a 1995 jeep cherokee xj 4.0 hi output 4x4 with 84k miles. Selling as i have fitted uprated 12 hole bosch injectors with the hope of improving mpg. It didnt lol. All injectors working fine and are in great condition considering age. These are the original injectors used by Chrysler. DO NOT BUY THE CHEAP CHINESE INJECTORS YOU WILL REGRET IT. cheers, Nathan. JEEP CHEROKEE KJ. 2.4ltr Petrol 5 Door. Fuel Injector Rail. 2005 05 Reg. Removed From A. 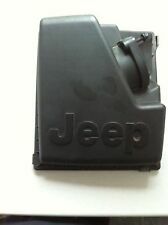 JEEP GRAND CHEROKEE WJ 2.7 CRD AIR FILTER LID. Removed from a 2002 2.7 CRD's. Jeep Chrokee Kj 2.8crd 02 - 08 163bhp Fuel Delivery Rail, Injector Rail 2007 . Condition is Used. 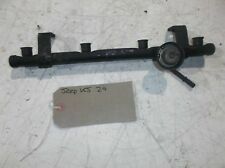 2002 - 2004 Jeep Cherokee KJ 2.8 CRD Fuel Injection Rail. We are a bonefide 'End Of Life' Vehicle Dismantlers situated in East Devon. We also boast an extensive used car parts centre. We willALWAYS resolve your issue but would ask that you call us in order to do so. We are a bonefide 'End Of Life' Vehicle Dismantlers situated in East Devon. We also boast an extensive used car parts centre. WE BUY LATE VEHICLES FOR DISMANTLING. From a year 1997 Jeep Grand Cherokee ZJ/JG 4.0 Petrol. Nous pouvons vous aider si nécessaire. Isle of Wight, Scottish Highlands and Islands of Scotland:- HS, IV, KA27-28, KW, PA20-49, PA60-78, PH17-26, PH30-44, PH49-50, ZE, Channel Islands (Jersey & Guernsey), Isle of Man and Isles of Scilly and Northern Ireland :- IM, TR21-25. From a 2001 Jeep WJ 3.1 Turbo Diesel VM Motori Engine, Automatic Transmission. Based in Halifax, West Yorkshire, we will do all we can to ensure you get the OEM parts you want, at an unbeatable price. REMOVED FROM 2004 JEEP CHEROKEE KJ 2.4 PETROL. OUR REF MA 545. JEEP GRAND CHEROKEE MK2 WJ 2.7 CRD 03' INJECTION RAIL A6120700095 / A6110780149 / A0011537528 / 0281002498 / 0445215007, AS PICTURED. MAKE AND MODEL: JEEP GRAND CHEROKEE MK2 WJ AUTO (FACE LIFT). GEARBOX:AUTOMATIC MILLEAGE: 150,269 FUEL :DIESELBODY COLOUR:BLUE. Jeep Grand Cherokee ZJ ZG 93-99 4.0 engine bay fuel rail plastic cover trim . JEEP CHEROKEE KJ 2.8CRD,FUEL RAIL AND INJECTOR PIPES,REMOVED FROM A 2007 MODEL. JEEP CHEROKEE KJ SPORT 2.8 CRD 57' FUEL INJECTOR LINES PIPES SET, AS PICTURED. 2007 (57') ENGINE SIZE: 2.8 CRD (2776cc) AUTO. KJ LIBERTY AUTO SPORT 4x4 DIESEL. MAKE AND MODEL: JEEP CHEROKEE. GEARBOX:AUTOMATIC MILLEAGE: 102,282 FUEL :DIESELBODY COLOUR:BLACK. From a year 1997 Jeep Grand Cherokee ZJ/JG 4.0 Petrol. Isle of Wight, Scottish Highlands and Islands of Scotland:- HS, IV, KA27-28, KW, PA20-49, PA60-78, PH17-26, PH30-44, PH49-50, ZE, Channel Islands (Jersey & Guernsey), Isle of Man and Isles of Scilly and Northern Ireland :- IM, TR21-25. A6120700095 INJECTION TUBE < span class = notranslate ' > Diesel JEEP GRAND CHEROKEE < span class = notranslate ' > 2.7 120KW AUT D 5 doors (2003) 0445215007 PARTS USED. MPN A6120700095. Years, engine2007m., 160kw, 3000cc. The carJeep Grand Cherokee. Looking for used car parts?. We have lots of spare parts listed, and about 500 000 spares in the warehouse! Warranty on electronic devices is void if identifying mark is removed or has sign of tampering. Years, engine2003m., 110kw, 2800cc. The carJeep Cherokee. Transmission & Drivetrain. Looking for used car parts?. We have lots of spare parts listed, and about 500 000 spares in the warehouse! We are always willing to work out any problems. 0445215021 INJECTION TUBE < span class = notranslate ' > Diesel JEEP GRAND CHEROKEE < span class = notranslate ' > 2.7 120KW 5 DRS B AUT (2005) A6120700295 PARTS USED. MPN 0445215021. Power: Diesel. Type: Jeep renegade limited 4 x 4 Engine: 2.0 l diesel MultiJet 140hp. Jeep renegade BJ. : 04.2014 - 2018. Modell Renegade Limited 4x4. Marke Jeep. Besonderheit Vorführwagen, Original Jeep Bauteil. used - very good. OTHER PART NUMBER: 0992C. IT IS BEEN REMOVED FROM JEEP GRAND CHEROKEE 3.7 AUTO. (MAKE SURE THE PART NUMBER MATCHES THE ONE YOU NEED). IN GOOD WORKING CONDITION. PART NUMBER: 11943100-1. ONCE AN ITEM IS RECEIVED BACK IT WILL BE QUALITY TESTED ON OUR BENCHES AND CHECKED FOR A MATCH WITH THE ONE SOLD. Jeep renegade BJ. : 04.2014 - 2018. Type: Jeep renegade limited 4 x 4 Engine: 1.6 l and 2.0 l diesel. Modell Renegade Limited 4x4. Original fuel manifold tube. Marke Jeep. Besonderheit Vorführwagen, Original Jeep Bauteil. Part number 55251171 | 000552511710. Engine 1,6 D Multijet CRD. Model Renegade. Parts manufacturer Fiat. Fuel type diesel oil. SWIFT: INGBPLPW. 30 1050 1070 1000 0022 1597 3690. ING Bank Slaski. PART NUMBER: 53031124AB. Manufacturer Part Number 53031124AB. IT IS BEEN REMOVED FROM JEEP GRAND CHEROKEE 3.7 AUTO. ONCE AN ITEM IS RECEIVED BACK IT WILL BE QUALITY TESTED ON OUR BENCHES AND CHECKED FOR A MATCH WITH THE ONE SOLD. PART NUMBER: 53030840. Manufacturer Part Number 53030840. IT IS BEEN REMOVED FROM JEEP GRAND CHEROKEE 3.7 AUTO. (MAKE SURE THE PART NUMBER MATCHES THE ONE YOU NEED). ONCE AN ITEM IS RECEIVED BACK IT WILL BE QUALITY TESTED ON OUR BENCHES AND CHECKED FOR A MATCH WITH THE ONE SOLD. IT IS BEEN REMOVED FROM JEEP CHEROKEE 2.8 CRDI 2006 YEAR RHD. ONCE AN ITEM IS RECEIVED BACK IT WILL BE QUALITY TESTED ON OUR BENCHES AND CHECKED FOR A MATCH WITH THE ONE SOLD. (MAKE SURE THE PART NUMBER MATCHES THE ONE YOU NEED). PART NUMBER: 53031099. Other Part Number 53031099. Manufacturer Part Number 0280155972. IT IS BEEN REMOVED FROM JEEP GRAND CHEROKEE 3.7 AUTO. ONCE AN ITEM IS RECEIVED BACK IT WILL BE QUALITY TESTED ON OUR BENCHES AND CHECKED FOR A MATCH WITH THE ONE SOLD. Years, engine2003m., 110kw, 2800cc. The carJeep Cherokee. Looking for used car parts?. We have lots of spare parts listed, and about 500 000 spares in the warehouse! We are always willing to work out any problems. Years, engine1994m., 135kw, 4000cc. The carJeep Grand Cherokee. Transmission & Drivetrain. Looking for used car parts?. We have lots of spare parts listed, and about 500 000 spares in the warehouse! Warranty on electronic devices is void if identifying mark is removed or has sign of tampering.